Andrew Forbes discovers Bermuda, and is intoxicated not just by the Atlantic islands’ signature dark ‘n stormy cocktails; but by the diverse local cuisine; charming historic towns; quintessential coral-coloured sandy beaches; fabulous outdoor activities; and more than anything, the island’s unique and genuinely authentic style of hospitality. I wasn’t in Bermuda long before I realised that my few preconceptions about the island were far from the mark. I’ve travelled to the Caribbean many times, so I thought my experience would be similar – but I was wrong. First, this seems like a good time to clear something up – Bermuda is not in the Caribbean. It’s a common misconception, but the truth is that Bermuda is some 1,000 Km east of the US (and the coast of North Carolina), and more than 1,500 Km north of Puerto Rico. 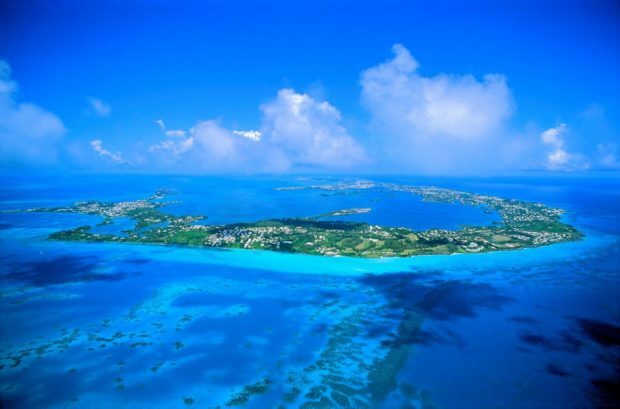 Bermuda is in fact a mid-Atlantic archipelago of islands with its own unique culture and style. 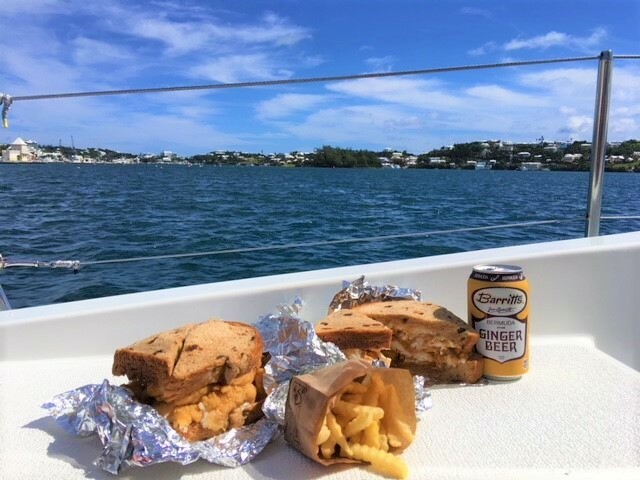 Local cuisine is always a great way to get to know a destination; and Bermuda has plenty to offer foodie explorers, where each dish can potentially be a small journey of discovery, telling part of the island’s unique story and history. As an upscale hideaway for stylist travellers, one can expect plenty of fine dining in the island, with sea-view restaurants offering sophisticated dishes of local fish – yet for me, it’s the local bites that are the most interesting. To get a favour of the island, try the fresh fish tacos at the charming Rosedon boutique hotel – part of the menu at the informal Huckleberry Restaurant. They also make great blackened local rockfish too with a creamy Bermuda Onion Soubise. For authentic street food, then it has to be a fried fish sandwich. In my experience asking locals where one finds the best elicited passionate responses from islanders – each had their favourite places. I tried the monster sandwiches from Art Mel’s Spicy Dicy, where you can expect sweet raisin bread embracing crispy fried fish, with plenty of homemade tartar sauce! Enjoy with a can of local ginger beer. To eat like a local, try a traditional Bermudan Sunday Brunch. We headed to The Flame, a family diner that sits right on the shore, with a terrace that reaches out to the quayside, offering uninterpreted views of the endless Atlantic. This is the place for a casual, friendly and authentic meal with the locals; home-cooking without any pretension. The dish to order is the Bermudan Codfish Breakfast. 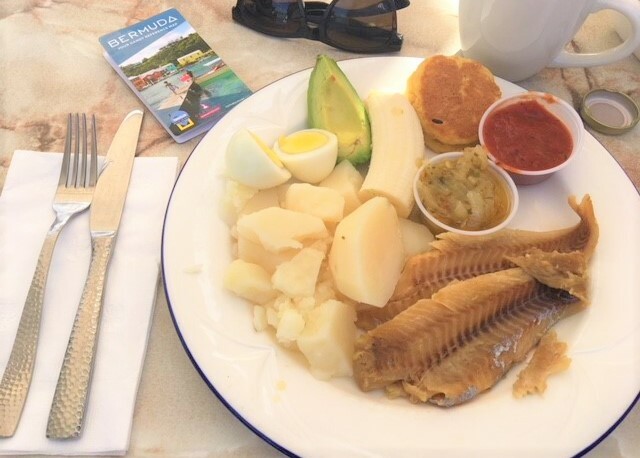 It is a full plate of salt cod that has been soaked to remove the salt and served with homemade sweet butter onion sauce and fried tomato sauce; boiled potatoes sliced banana, avocado and hard-boiled eggs. Don’t expect some fancy plate designed for the Instagram millennials – no this is real food made with love and it’s clear when you taste it! During the warm evenings you can choose a mellow time on a terrace or to step things up a gear with some nightlife. 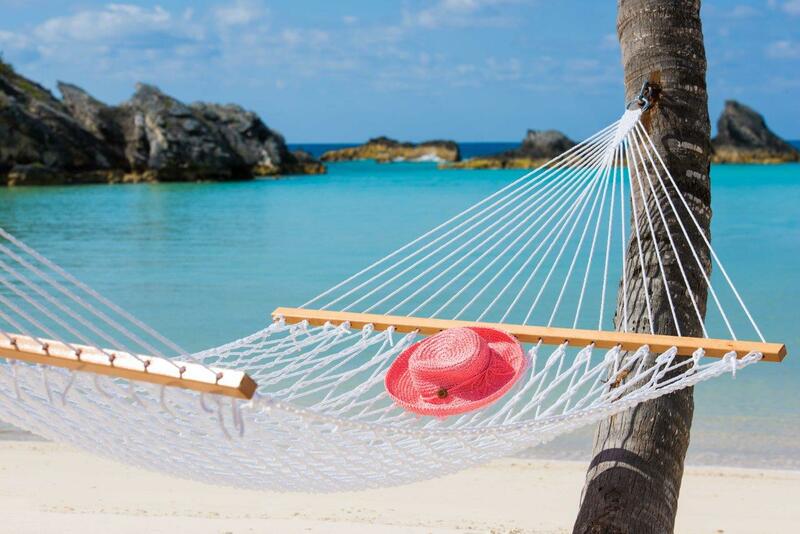 For inspiration on places to stay read my Bermuda Holiday Hideaways piece here. Either way, you probably reach for a cocktail once the sun goes down. 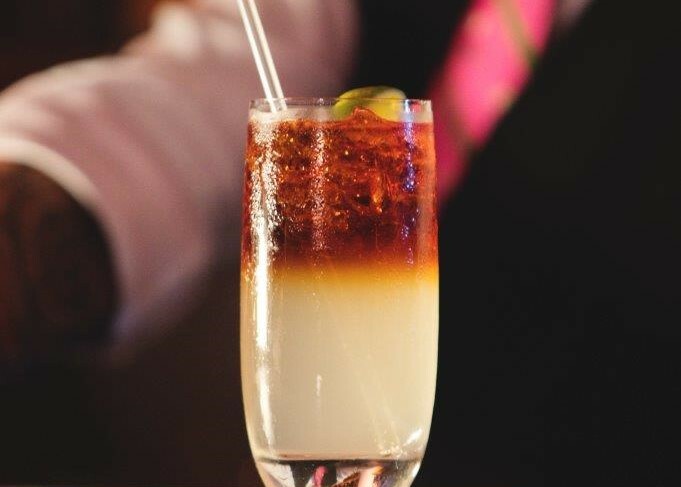 If you have already been to Bermuda, you’ll know it’s not long after arriving that you’ll have a Dark ‘n Stormy in your hand, made with local dark and syrupy Gosling Black Seal rum which is poured over spicy ginger beer to make a simple yet delicious, as well as great looking cocktail. In my mind to enjoy a great cocktail you need to be a great bar – and I found one; Marcus’ at the Hamilton Princess and Beach Club, in the capital Hamilton. Quite the surprise really; to discover such a cool bar and restaurant in this sprawling luxury resort. 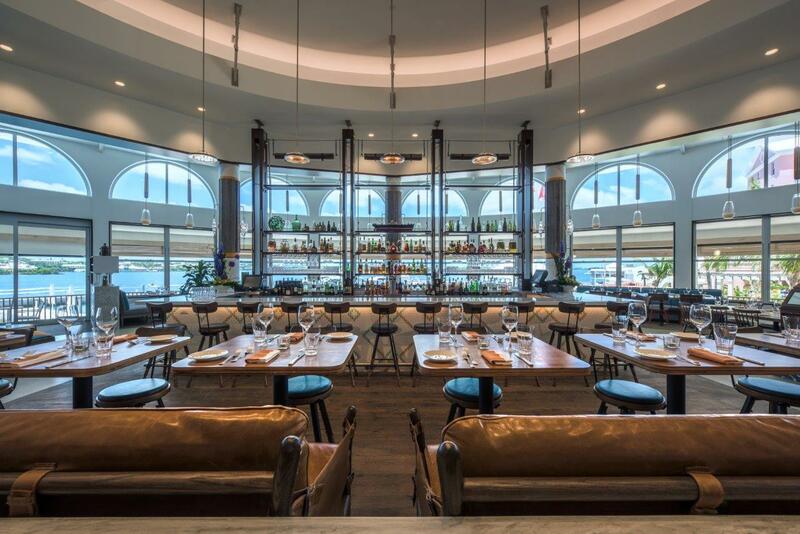 Chef Marcus Samuelsson heads an open kitchen that serves innovative modern cuisine, complemented by a dynamic bar. My first night was enjoyed sipping artisan cocktails listening to local musicians. The mellow sounds of saxophone filled the bar; a cool space punctuated with eye-popping contemporary art that competes for attention with the spectacular views. No trip to the island is complete without enjoying a rum swizzle – a cocktail of rum, fruit juices and bitters. 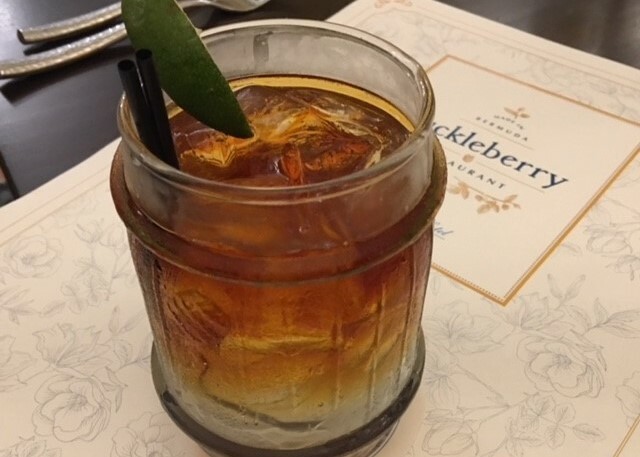 Tradition suggests that the Swizzle Inn created this island tipple, so before heading to the airport on your way home, make sure you stop off for a glass or two and toast your island holiday memories. Tourism maybe one the biggest parts of Bermuda’s finance-dominated economy, yet thankfully the island hasn’t become a tourist theme park. 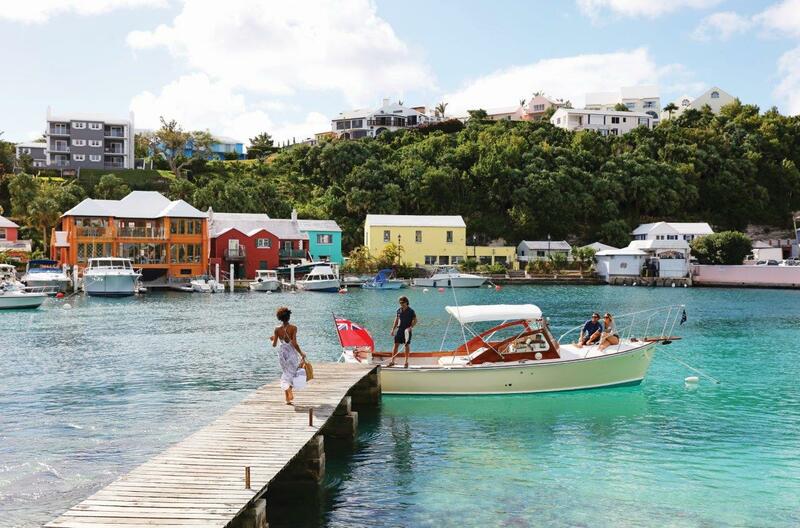 If you can allow yourself to be lured away from the iconic coral-coloured pristine sandy beaches of the island, then you will be rewarded by the many surprises across this charming island, which has been inhabited since the 1600s. It is a destination rich in colonial history, with beautifully preserved properties, found within vibrant communities. 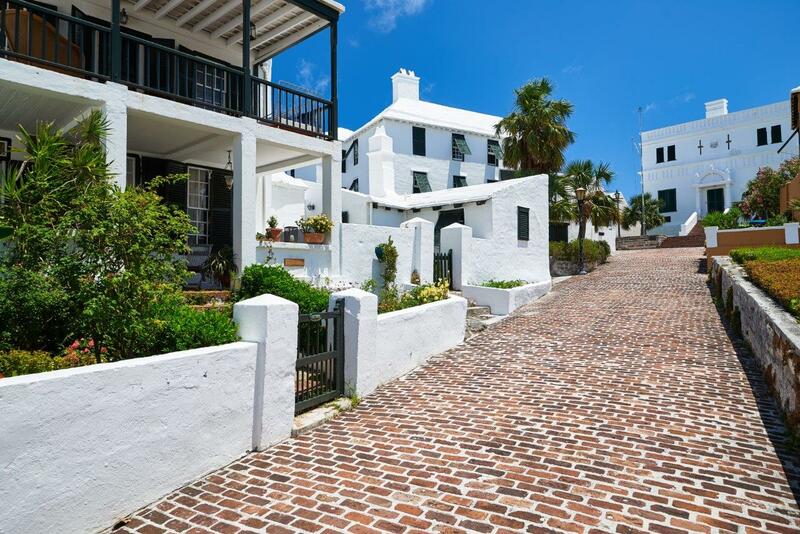 The Town of St. George, Bermuda’s UNESCO recognised town, a former capital is chockful of fascinating sights and secrets. It’s a must-visit. When I was there, my curiosity had taken me up a brick cobbled street from the historic town’s main square towards the 17th century State House, the former parliament of this sub-tropical British Overseas territory. As I paused to admire a charming old house, with a double covered porch and front flower garden surrounded by a low wall, I was invited in! It was to be one of the many examples of friendly, hospitable gestures that I was to experience during my stay! So, I climbed the few steps up on the veranda and walked into the cosy living room, with its low beamed ceiling. The floor boards were polished covered with vintage rugs; in the corner a steep, narrow timber staircase curled up from the ground floor living room, the banister worn smooth by centuries of use. 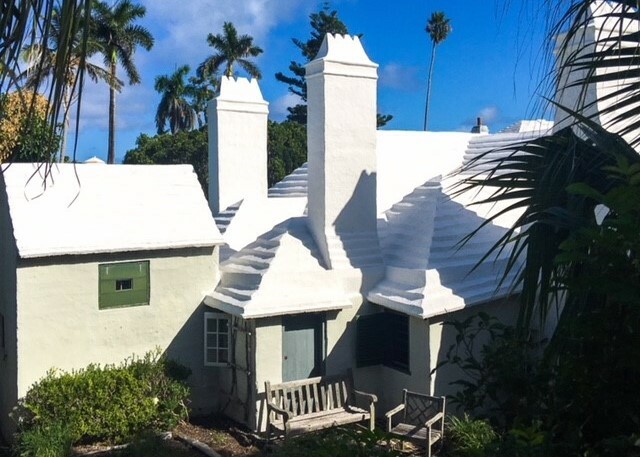 Serendipity had led me to probably the oldest house on the island of Bermuda, Bridge House. 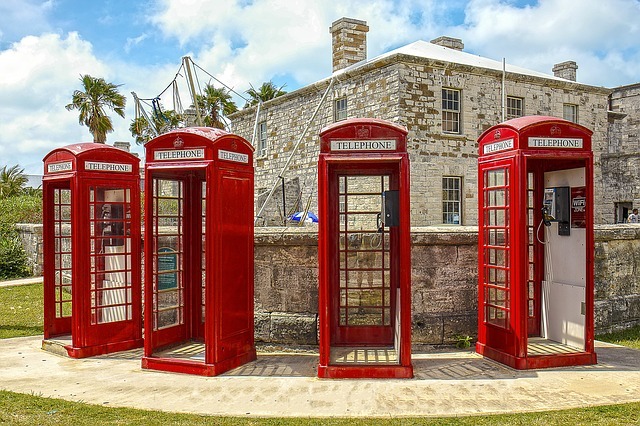 When it came to exploring Bermuda, it was a very much a 21st century affair. I buzzed around the island with my exhilarating Twizy electric car, the latest trend to hit Bermuda. These cool, twin- seater cars are such fun to whizz around the winding lanes of the island. 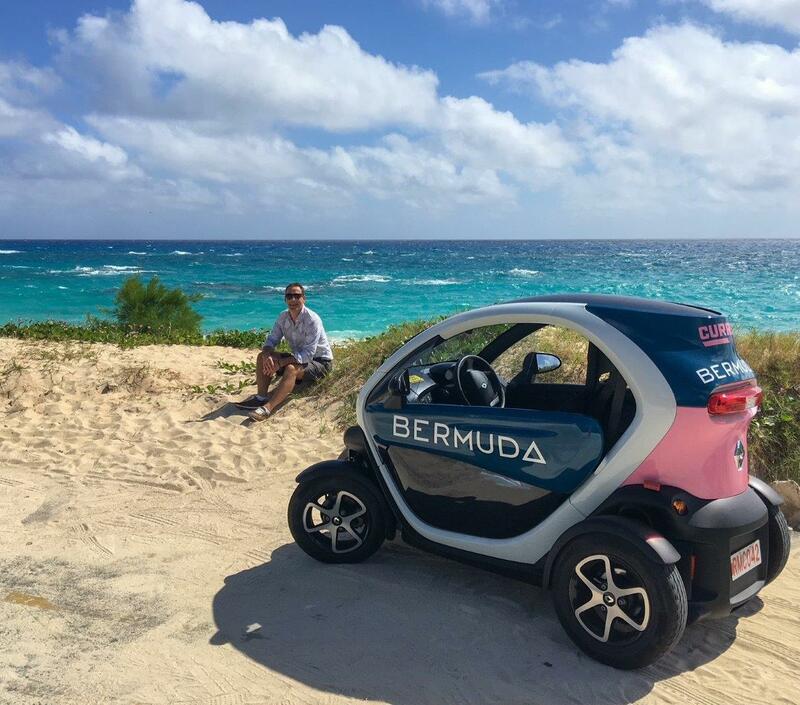 You can read my Discovering Bermuda by Twizy article here. My final misconception that was well and truly put to rest was that Bermuda was a quaint island backdrop for honeymoon photo shoots I was quite wrong. 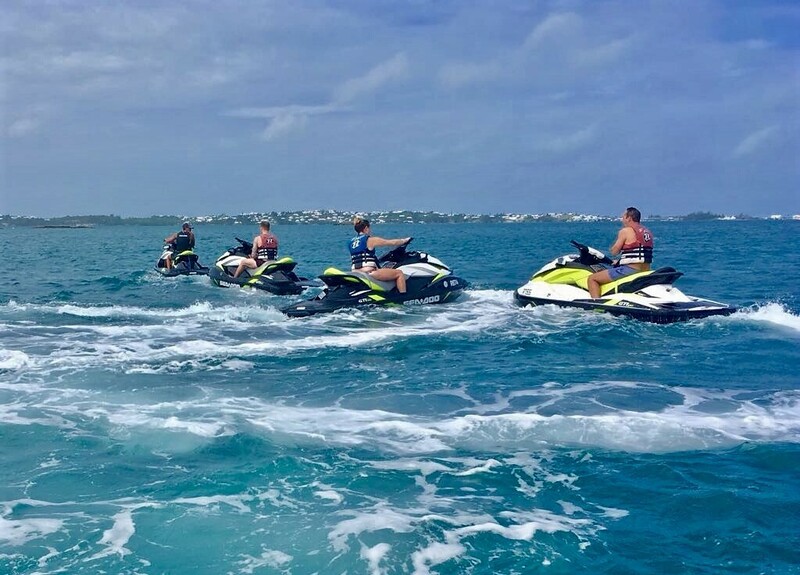 Bermuda may well be a perfect for lovers looking for a romantic getaway, but it’s also has a thriving activity adventures scene catering to families, couples and groups of friends that are looking to make some special memories. 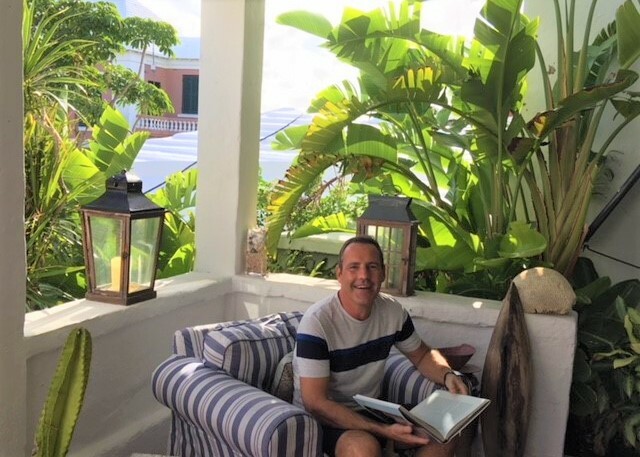 You can read about my Bermuda Bucket list moments here. But don’t just take my word for it – if you feel that Bermuda is beckoning, then go discover it for yourself. It’s not what you might think. Exclusive, undoubtedly; flashy, not at all; friendly, most definitely; authentic, absolutely! For further inspiration for Bermuda travel planning, check out the island’s official travel & tourism website, Go To Bermuda.